Lake George is one of the best places to vacation in the country if you’re looking for gorgeous scenery, convenient access and world class outdoor activities. Nestled just inside the Adirondack Mountain State Park in upstate New York Lake George has a little something for everyone including hiking, skiing, horseback riding, boating, fishing, and outlet shopping. If you’re the outdoor type you’re going to be in heaven, with the largest state park in the entire country at your fingertips. With over 40 sq. miles of water there’s plenty of space to do whatever you like. You’ll be able to purchase an out of state fishing license and fish the more remote waters for Small Mouth Bass and Pike. If you’re looking for something a little faster paced Lake George is ideal for boating, jet skiing and is close to some amazing winter sports. If someone in your family is not big on the outdoor sports don’t worry, we have them covered too. Lake George is home to some great outlet shopping with shops like, Tommy Hilfiger, Nautica, Bass, Van Heusen, Yankee Candle, Banana Republic and many more. You’ll also find a wide variety of restaurants and other activities to keep your family busy. Another reason why Lake George is so visited and has been such a popular stop for many vacationers over the years is its beautiful fall foliage colors that we experience in late September to early October. During this 3 week period your find vibrant, pinks, oranges, yellows, and purple leaves setting the surrounding Adirondack Mountains on fire. 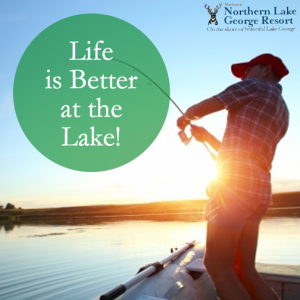 Now that you know a good deal about what Lake George has to offer is there really a good reason why you shouldn’t book your stay with us? Call us now to book your stay and we’ll make sure you have the best trip ever.